On your marks, get set… for a week of Paralympic fun and games against Atos! And we are asking the whole of the anti-cuts movement to join us in our opposition to the company most responsible for driving through the government’s brutal cuts agenda. Let’s make it Games over for Atos. We won’t let them get away with murder, so join in The Atos Games however you can – online, on the phone, or on the streets. Monday 27th: A coffin full of your messages about Atos will be delivered to its doorstep. 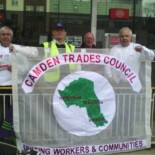 This entry was posted on August 3, 2012 by CAMDEN TRADES COUNCIL.